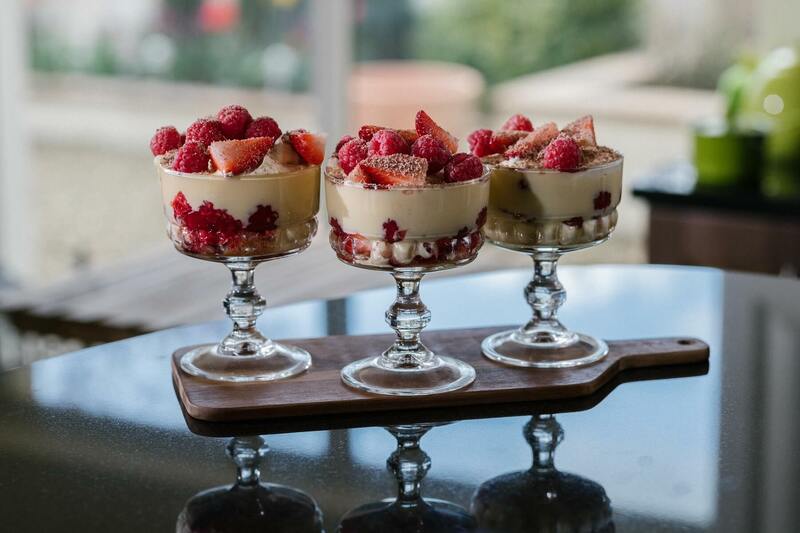 This trifle recipe is one that my family has always loved. Recipes can vary from family to family, but the basic elements remain the same. A sponge cake soaked in spirits, layered together with custard, whipped cream and fruit. I believe one of my aunts used to add cherries to hers as well. Meanwhile, mix the sugar and cornstarch together. In a large mixing bowl, whisk together the egg yolks and the sugar mixture until light and smooth. Remove the warmed milk from the heat and while whisking the egg yolks constantly, dribble a few drops at a time into the yolks. Adding the hot liquid very, very slowly in the beginning will temper the eggs, allowing them to warm gradually so that they don't curdle, or worse, scramble! Once you have dribbled in a good amount you can increase the amount of liquid you add at a time, whisking continuously until all the milk has been added. Cut the cake into large manageable squares. Cut those squares in half horizontally. Open the squares so that the cut sides are facing up. Brush the cake with the cream sherry. Spread the Victoria sponge with the raspberry jam. Cut the cake into cubes. Combine the heavy whipping cream and the icing sugar in a larger mixer bowl. Beat on high for 2 minutes, or until stiff peaks form. Keep chilled in the refrigerator until ready to assemble.